Bard Medi-Aire® Biological Odor Eliminator uses a unique concentrated formula that eliminates unpleasant biological odors associated with urine, feces, emesis (vomit) and necrotic tissue. Medi-Aire Deodorizer Spray does much more than simply cover up odors with another smell. Medi-Aire's biological formula chemically nullifies odors by targeting the molecules that cause bad smells. When Medi-Aire comes into contact with a "smell-molecule", it combines with the molecule to neutralize it. After smells are chemically neutralized, Medi-Aire Spray also leaves a pleasant, long-lasting scent behind like a typical Air Freshener does. 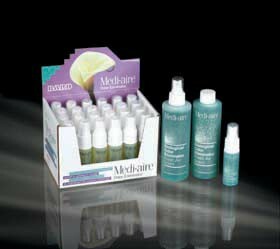 Medi-Aire is available in fresh scent, lemon scent and unscented. Biological air freshener is a must for hospitals, doctors' offices and home care situations where biological odors are present. I'm look for pricing on the refill bottles of unscented Medi-Aire. Your website doesn't show the refill bottles for the unscented (only for the fresh scent). I'm interested in a box of 12 refill bottles. What is the cost (either per bottle or for the dozen)? Is there any other fee, such as shipping and/or handling? If yes, what is that charge? Thank you. Current costs are shown on our website and are updated constantly. There is a shipping charge applied once your order is complete. Shipping costs begin at $7.25 and escalates based on other factors. Will this product remove odors from shoes? How can I get a SDS sheet for product Medi Aire? Hello Mrs. Polley: SDS Sheets for Medi Aire are available Medi Aire's home website. Amazon blows you out of the water on ship times. How can it take a week plus to mail a 1oz. spray bottle? 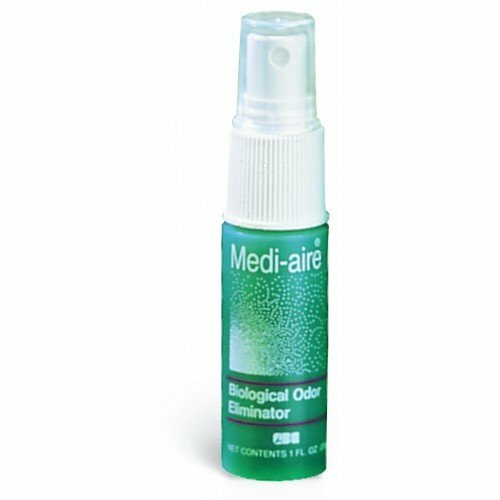 I've had a colostomy for 20 years and tried many "odor eliminators" and By far Medi-Aire Biological Odor Eliminator DOES the job! For me, this product saves me from being highly embarrassed anywhere I would go! It's truly changed my life, I use it inside my colostomy bag and as I'm changing the the colostomy bag I obviously use the spray and trust when I say this product works!! I first came accross this while at a bnb run by a nurse - amazing aroma and gets rid of smells immediately. Will continue to purchase the "fresh scent" version. Must have in any home or office. Having spent some time lately in the hospital I came across a very similar product and really liked it. When I went on line to research it I found this one. I ordered it after reading the other reviews. I really like it and it DOES what it says it will! I will be ordering it again! Best odor eliminator EVER! Very fast shipping! Will always reorder...wish I knew sooner! Best air freshener, spray, deodorizer I've ever used. Bought refills in this and the citrus scent. Like both scents. this product was used at the hospital in colostomy care. This product will relieve any odor I have run across. Have used it even for the dogs when they were sprayed by a skunk. And I mean that the odor will be gone, not just covered up by another odor. Shipping was very fast.